I'm out of shampoo excepting the stuff I use once a week for my gray hair. Trust me. That purple shampoo is NOT what I want to wash my hair with daily. For one, it's expensive and for two, it will make my hair look purple. Not Barney or eggplant but add a purple dimension to my gray color. There are a lot of crazy colors I'd consider as a joke. Purple is not one of them. But I remembered having a couple of those free bottles one gets from hotels tucked away in the top drawer of the bathroom sink, at least I think there are a couple of bottles which will do until I can get over to the store. I also need kitty litter so it's a good trip. I opened the drawer and saw this. 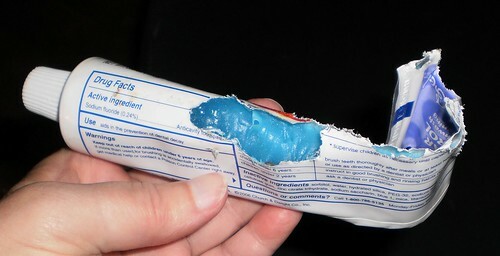 This is the tube of toothpaste I stuck in the drawer when I received the free tube to review for that survey. Mice. Mice did this. I rooted around in the drawer for the shampoo bottles (there were, in fact, 2 small bottles) and found more "evidence" in the bottom of the drawer for this being a camping location for mice. I have the mice with the shiniest teeth and least cavities on the block. Now, while you're being grossed out, you need to realize I grew up in a big ol' Iowa farmhouse. We had mice in the walls. I used to have a couple of mousetraps in my bedroom and nothing scares you more than that snap occurring at 2 a.m., waking you from a sound sleep. The thing is, I don't hear mice in my walls. Two years ago, Pilchard was bringing mice up from the basement on the average of 2-3 a week for a couple months. She doesn't go into the basement every night as she used to. She caught one 10 days ago, which I managed to catch and toss outside, but the activity we used to have has dwindled. I have not seen "evidence" of rodents anywhere else in my house, nowhere. The toothpaste went into the drawer in September so this is recent activity. I checked the other drawer and the area under the sink. No mice "leavings". I think it's because there are bars of scented soap and bottles of scented lotion in the drawer and under the sink. There was only the toothpaste tube, the bottles of shampoo and plastic travel cases in the drawer they occupied. I have since tossed a bar of soap in that drawer. I took the flashlight to the basement and checked the foundation trying to find a hole, any way they could be coming in. I found it. It's really hard to see from both the inside and the outside but it's where a cable went through the foundation to the old air conditioning unit. Research on the internet says that stuffing the hole with steel wool will prevent mice from entering AND leaving the house. One of the basement windows is warped just enough to not close properly although I can't see a mouse wriggling in through that small gap. Still, I can't get the window closed to latch it so duct tape to the rescue. I couldn't find any steel wool in my house so I'm going to grab a can of spray foam that we have in the office which we use to plug holes in some of our machine boxes. I figure that will work just as well. Finally, I had a talk with the resident mousers and encouraged them to find any vermin in the house and bring them to me so we can remove them from the premises. I'll be thoroughly cleaning and disinfecting that drawer this weekend.